Micro Cap Stock - What Does It Mean? What is a micro cap stock? What is the definition of a micro cap stock? What constitutes a stock being classified as a "micro cap"? A stock is classified as a "micro cap" if it has a market capitalization of between $50 and $300 million. 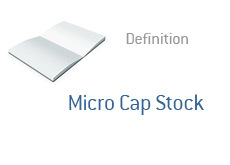 Note: the only classification of stock smaller than a "micro cap" is a "nano cap", which encompasses all stocks with market capitalizations of less than $50 million. "Micro caps" tend to be viewed as more speculative investments that have a greater degree of risk. On the other hand, "micro caps" obviously offer rich potential. For instance, a $60 million "micro cap" could easily double in a short period of time (if the right things happen to it), whereas a stock like Microsoft would not offer the same sort of upside potential. The downside to this, of course, is that Microsoft is a steady, established business, whereas "micro caps" tend to be more hit and miss. Note #2: there is no concrete definition of the term "micro cap"
Example: XYZ is a small biotech firm that is currently trading for $7 per share. The market capitalization for the company is $104 million, which makes it a "micro cap" stock. The price of the share is irrelevant when determining whether or not a stock qualifies as a "micro cap" - rather, market capitalization is used instead.